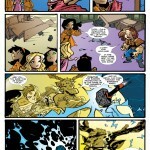 Brat-halla: Webcomic of the Young Norse Gods » Would You Buy a Brat-halla Trade? Home » News » Would You Buy a Brat-halla Trade? Would You Buy a Brat-halla Trade? I know we asked this nearly two years ago, but we have a lot of new readers now and wanted to see what the interest is like now. Even if you answered before, please take the time to answer. We made it quick and easy… just two clicks and you’re done. Thanks! A trade would be great. I’d get one for me, and give a couple of copies as gifts. Hmmm… so it seems we’d definitely need to make it gift-worthy. I would get two for myself, one to read and one to keep nice… then everyone on my list would get them too. I love this comic and share it with people all the time! Thanks for all the sharing you do. We’ll be making this happen one way or another. The poll is mostly to give us a better idea of how we’re gonna go about it. I’d buy one. Yes, it’s free on-line, but it would be nice to have a copy to take with me somewhere where there might not be internet. And it’s easier to show people a trade and get them hooked. True. Very true. Trades are good for hooking people. I would buy one, if it was translated to my language, I’m sorry, I like the comic, but I have a credo of not buying untranslated goods. I can’t guarantee anything, but I’ll do some translation research and see what options are out there. I hate to pay shipping, so if I knew you guys were at WizardWorld Chicago (or San Diego, my first year going!) I would put aside money to buy it when I saw you guys. Didn’t we meet you at WW Chicago a couple years ago? When they get published, we’ll definitely have some on hand to sell. Yep, that was me! I am pleasantly surprised you remember! So it sounds like you’ll be a Wizard World this year? Where else are you going to be? Chicago will probably be the only show I make it to this year. Unless the universe rewards me with a lucky lottery ticket. To follow up on my comment, that’ s how I’m handling it for the other webcomics I read. I’m going to buy trades for Shortpacked!, Evil Inc and others at San Diego. It’s cool to meet guys face to face and beg for a sketch in the trade. A trade paperback. Basically, it’s a collection of the Brat-halla comics in a printed book format. ah, thanks. then yes, I would buy one….or more. depends on how much they cost though. Price will largely depend on how (or by whom) it gets published. We’ll do our best to make sure it’s as affordable as possible. Sounds like I should organize a contest when the trade becomes a reality. Hmm… what kind of contest could it be? Maybe a Brat-halla scavenger hunt. I’ll get it if you get it out to the stores. I like to suport the local bricks and mortar store and as such I’d like to buy ot through them! That’s the plan right now. Seth, Anthony and I are also big supporters of the local book and comic stores. I’d buy two on the spot. One for me, one for a friend who is really into Norse Mythology and Religion. I’ve already sent her the link to this web comic, but nothing beats having a hard copy on hand. I guess I should have had an Option 6: I’d by more than one on the spot. And I just thought of two more people who would love to have trade copies of the webcomic too. My parents (each would get their own copy). So that’s four. I did want to buy a t-shirt, but I had issues with the women’s t-shirt sizes. What they call a large is certainly NOT a large. Yeesh. At least this site warns you that the t-shirt sizes for women are made extremely small. I guess I could have gone into the men’s sizes, but then I’d look like I was wearing a shapless sack once I got a size that accommodated a generous portion of my upper anatomy. And of course none of the men’s t’s come in the colour pink. Thanks for all the great feedback everyone’s providing. It’s brought up things to consider and things to look into. All of which is very helpful, so feel free to keep those comments rolling in. Definitely. One for me, several as gifts. Your Dang right I would! As well as several for gifts! If those of us who do enjoy don’t support, then you may end up like several of my other favorites, to whom I tried to late, and they were lost and gone from the ‘net. This comic is ossum. Really enjoy checking it whenever I can. However, having a problem lately with the RSS feed and twitter updates box – it is now interfering with viewing the comic and bars reading of some panels. Any recommendations as to how to bypass this? Don’t want one of my favourite comics appeal diminished by something like this. That should have been fixed a while back. What web browser are you using? In the meantime (so you can still read the comics while I’m working on the issue), I’ve set it up so that you can click on any comic page and it’ll bring up a new pages that’s just the image by itself.